Have you been struggling to sleep at night, wake up repeatedly, or feel fatigued when you wake up in the morning? If you have sleep apnea, it is important to recognize the seriousness of this sleeping disorder is. Don’t fall into the trap of thinking it’s not a big deal, or convince yourself you can function without a proper night’s rest. Sleep apnea affects your health in profound ways, and needs to be taken seriously. Obstructive sleep apnea is a serious sleep disorder that disrupts your natural sleep cycles and affects your overall health and wellbeing. Sleep apnea is caused when the muscles in your throat relax too much while you’re sleeping. These muscles can block your upper airway, stopping the flow of oxygen while you sleep. Your brain senses the lack of airflow, and wakes you up to open the airway. This can happen hundreds of times in one night, and while you might not remember waking up, these frequent interruptions will prevent you from getting enough REM sleep, and you won’t feel refreshed when you wake up in the morning. If you sleep on your back, or wake up in the night feeling like you can’t breathe, you’re likely suffering from sleep apnea. Do your loved ones complain about your extremely loud snoring, shallow breathing, or even lack of breathing during the night? These are signs that your airway is blocked, and you need to take a closer look at your sleeping habits. Sleep apnea is more common than you think, and it’s estimated that roughly 25% of Americans adults struggle with this sleep disorder. Living with obstructive sleep apnea is linked to a host of health problems. It’s associated with a high risk of depression, anxiety, and other mental health disorders. Heart attacks and strokes are also more common for people who aren’t sleeping through the night, and it also increases your chances of diabetes. The reduced blood oxygen levels also affect your mood, and you’re far more likely to be upset and irritable, leading to problems with your family and close friends. Sleep apnea is also a major safety hazard, since people who are extremely fatigued aren’t able to remain alert and aware when on the job. If you work as a bus driver, train engineer, or heavy machinery operator, one wrong move could be detrimental. Even driving home from work, or taking a Saturday drive out of town can end in disaster if you feel drowsy on the drive, or even fall asleep behind the wheel. In fact, drivers with sleep apnea are five times more likely to have a motor vehicle accident than drivers who are able to get a good night’s sleep. Your sleep apnea isn’t just affecting you, but it’s having a major impact on your partner as well. Many studies have found that your partner experiences a lot of sleep disturbances caused by your snoring, or waking during the night, and partners report insomnia, fatigue, and increased headaches and irritability. Sleep apnea can lead to marital difficulty, and this is one more reason to take this problem seriously. While you might snore loudly, or wake up noticeably fatigued, some cases of sleep apnea are harder to detect, and many people live with undiagnosed sleep apnea. You might snore softly, or be unconscious of the fact that you’ve woken up many times in the night. However, you will begin to notice the affects of lack of sleep, feel worn down, and struggle with fatigue. Even if you’re not snoring loudly, you should visit a sleep specialist if you’ve been feeling tired, or have a hard time getting up when the alarm rings. 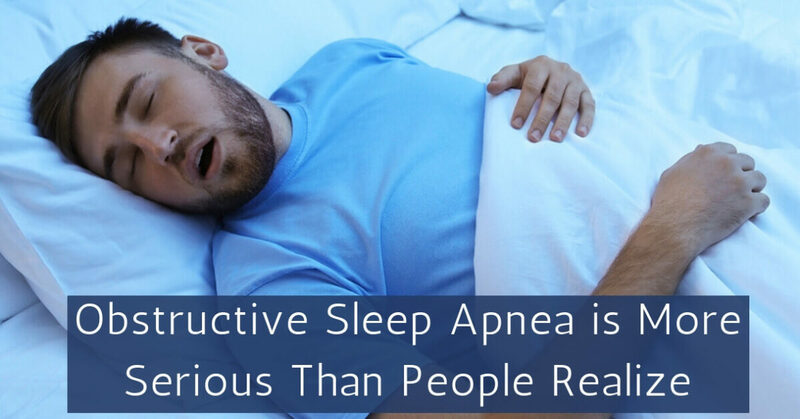 If you’re worried that you haven’t been sleeping deeply, and are tired of fighting fatigue, visit us at Sound Sleep Medical to learn more about obstructive sleep apnea, and do a sleep test. Sleep apnea is more serious than you realize, so don’t waste another day, but visit us as soon as possible and do the right thing for your health.